In the past, Davis has expressed concern over the harmful effects of shallow Scripture reading, which she finds to be an all-too-common problem, at least in some North American churches. What she speaks of as shallow readings of Scripture flow out from the presumption that we already know what the text has to say to us, so our readings become more like rehearsals than fresh explorations (xii). In sermons, this can manifest itself in a tendency to sentimentalize the Bible or rely too heavily on (sometimes rather contrived) illustrations to keep up the interest of those sitting in the pews. In light of these things, Davis wants to recover the importance of reading Scripture in deeply theological ways for the Church, especially from the pulpit. Stanley Hauerwas hits it on the head when he comments in the foreword that this sermon and essay collection “not only provides the exemplification of a theological reading of Scripture but also demonstrates the power of such a reading when articulated by someone of depth and elegance” (xiii). For Davis, the aim of preaching goes much deeper than merely entertaining audiences on Sundays or telling heart-warming stories to give listeners temporary respite from their troubles. The kind of preaching she wishes to see flourish “is explicitly oriented toward the biblical text and characterized by a willingness to acquire new habits and categories of thought in order to read it with comprehension” (90). Davis’s practice of letting exegesis anchor her preaching also results from the influence of New Testament scholar Krister Stendahl. In 1983, while visiting Yale Divinity School to deliver a series of preaching lectures, Stendahl observed during an informal lunch that, “Your goal should be that the next time they turn to that part of the Bible, it will say a little more to them. The purpose of preaching is to give the text a little more room to shine” (xxiii). That aim—giving “the text a little more room to shine”—has profoundly shaped the arc of her preaching over the years, and it can be distinctly felt while reading through the many sermons in Preaching the Luminous Word. 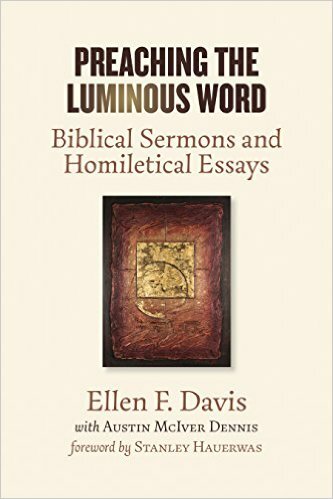 In one of her homiletical essays, Davis compares the biblical preacher to an elementary language teacher intent on giving her students the linguistic skills necessary to more fully dive into the world of the text (93). This goal of cultivating fluency explains in large part why she is so passionate about preaching across the whole canon. Davis wants both pastors and lay believers to learn to inhabit the Christian story as a whole and find their place in the drama of reconciliation. All of this ends up making for quite the reading experience. One can’t reflect long on her sermons without being persuaded that “no matter how strange or unappealing a given passage may be, there is something in it for us, something to be gained from the work of painstaking, acute listening” (90). Out of the dozens of moving and formative sermons presented in the book’s pages, one of my favorites was Davis’s 2006 sermon given at Duke Chapel, “God’s House.” In it, Davis delves into the early days of David’s kingship, looking specifically at some of the less obvious layers of meaning in King David’s desire to construct for God a proper temple, a house made out of cedar. She explains that, “Cedar was the luxury building material for public buildings, elegant palaces and temples that carried the fragrance of the great north woods… In that world, then, the aroma of cedar was the smell of power” (65). In other words, David’s plan to build a cedar temple for God was not wholly innocent of the desire to attain more power and prestige on the national stage. God responds by reminding David of His uncontainable nature, and Davis notes that God tells the young king that He will actually be the one doing home construction, promising to build and preserve the house and throne of David forever. Davis’s thoughtful exploration of 2 Samuel 7 highlights an important dimension of the narrative that a faster reading might unfortunately pass over, and she thereby helps foster the formation of a worshiping community that can rejoice with depth and gratitude in response to the opening words of Matthew: “An account of the genealogy of Jesus the Messiah, the son of David…” (NRSV). Ellen Davis’s love for words (and the Word) makes these sermons and essays a joy to read. Her in-depth familiarity with the narratives of Scripture give readers much to chew on and learn from, and the homiletical habits she argues for— reading slowly, caring deeply for exegesis, and remaining open to the surprising nature of the text—are practices I believe we all can hope to grow in. So, whether or not you work regularly from the pulpit, Preaching the Luminous Word invites you to sit down and spend some time with text alongside Davis. For me, that’s an offer I’ll be taking up again and again. *Disclosure: I received this book free from Wm. B. Eerdmans Publishing Co. for review purposes. The opinions I have expressed are my own, and I was not required to write a positive review. This entry was posted in Book Reviews and tagged Book Reviews, Ellen Davis, Interpretation, Old Testament, Preaching by joecrow91. Bookmark the permalink.